We love Rick Stein’s recipes as everything seems to come from true inspiration and has been tested in a real world kitchen so it all works. This recipe is no exception and delivers in flavour and balance perfectly. 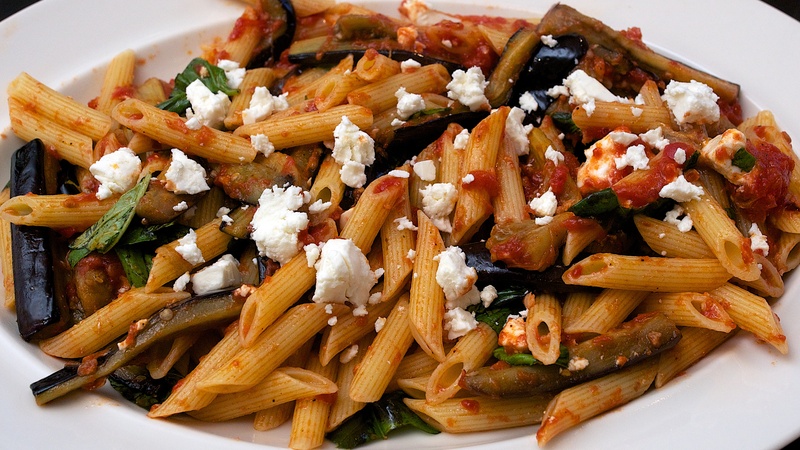 Pasta alla Norma is traditionally made with spaghetti but worked just as well penne pasta as a substitute. Wine Suggestions: Aubergine tends to work with Southern Italian reds really well, but we had an unexpected burst of sunshine so opened a Provençal rosé, Chateau Vignelaure La Source, which is an old favourite. 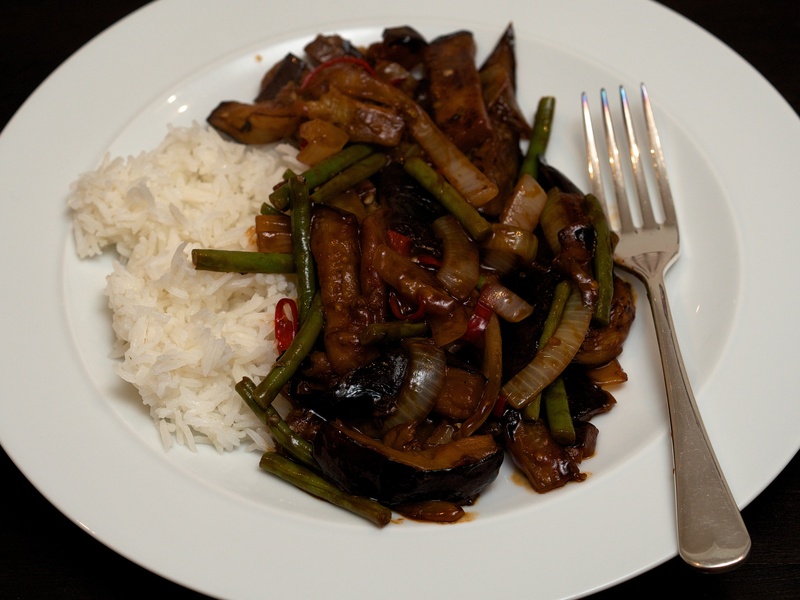 It worked a treat and will definitely try it again with other aubergine dishes. Trim the aubergines and cut into two across the middle, then cut each piece lengthways into chip-sized sticks. Toss with 1 tsp of salt and set in a colander over a bowl to drain for 30-40 minutes. Meanwhile, if using fresh tomatoes, squeeze them over the sink to get rid of most of the juice and seeds. Roughly chop the tomatoes and set aside. Bring a large pan of water to the boil (about 4.5 litres) and season generously with salt (about 8 teaspoons). Pat the aubergines dry with kitchen paper to remove the salt and any liquid. Heat 4 tbsp of the frying pan, add half the aubergines and fry until lightly golden. Lift onto a plate lined with kitchen paper and leave to drain while you fry the next batch. After removing the second batch of aubergine, leave the oil in the frying pan to cool. Put the spaghetti into the boiling water and cook according to the packet or until al dente. Before the pasta is ready, add the remaining oil and the garlic to the cooled frying pan and return to the heat. When the garlic begins to sizzle gently, add the crushed chillies and the tomatoes and cook over a high heat for a few minutes or until they have broken down into a sauce. Season well and stir in the aubergines. Drain the pasta and add to the sauce with the torn basil and half the cheese, then toss well. Divide between warm bowls and serve sprinkled with the remaining cheese. Wine Suggestion: Try a Mediterranean-style wine, a Primitivo or something similarly juicy from the south of Italy. We paired this with a lovely organic wine by Michele Biancardi, his Uno Piu Uno which is a cracking blend of Primitive and Nero di Troia. Only 12.5% abv but juicy and delicious so it didn’t overwhelm the lamb and aubergine and had enough depth to compliment it perfectly. Season the lamb cubes with the salt and pepper. Heat a large pan over a medium-high heat, add the oil and the diced lamb, and sear the meat all over. When the meat has browned (about 5-6 minutes), add the aubergine, tomato, onion & garlic. Cover and leave to steam for 5 minutes, then remove the lid and stir in the chilli and thyme. Reduce the heat to low and cook slowly for about 15 minutes, then pour in the water and pomegranate molasses. Keep cooking on a low heat for 50-60 minutes or until the veg have broken down and the meat is soft enough to tear with a fork. Serve with bread so you waste no sauce! We’re much keener on nutty bulgur than quinoa that seems so popular at the moment. Bulgur makes for a much more interesting salad in our opinion and these aubergine and halloumi kebabs are a great veggie option for the barbecue. Leftovers taste nice for lunch the next day too. Brush the aubergine strips with olive oil and barbecue until softened. Thread onto skewers with the halloumi cubes. Mix the remaining olive oil with the chopped capers and mint. Barbecue the kebabs until the cheese is golden and drizzle over the dressing to serve. Meanwhile, cook the bulgar wheat in boiling salted water for 15 minutes or until tender, adding the peas for the last few minutes. Make the dressing with the oil, lemon juice and seasoning. 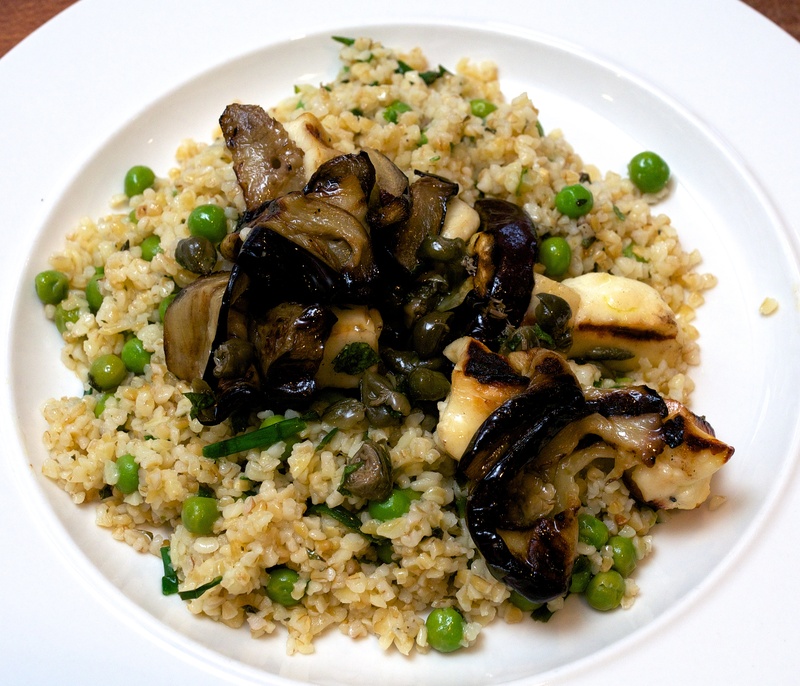 Fold the herbs through the drained bulgur wheat and peas and gently stir in the dressing. 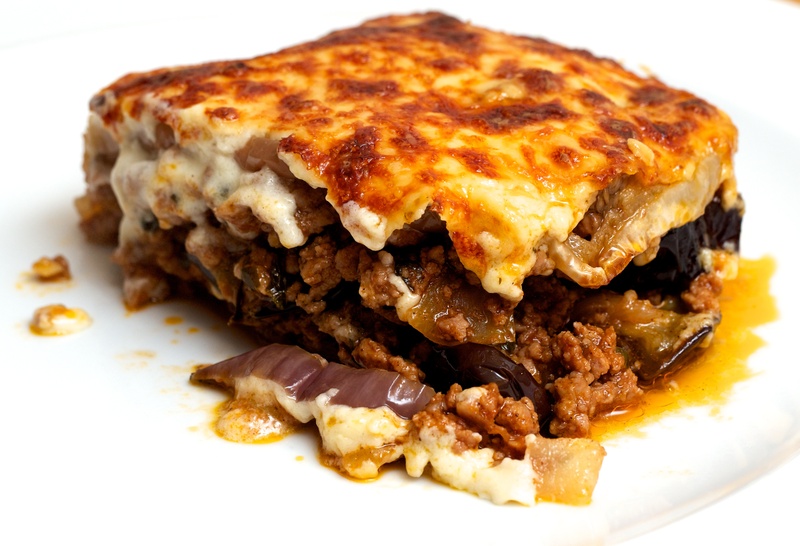 This is a really lovely moussaka which rates as one of our “comfort” dishes. We especially like roasting the aubergines in the oven rather than frying them which always seems to require vats of oil. The combination is a classic and is not difficult, but it does take a little time to bring together. It is always well worth it. 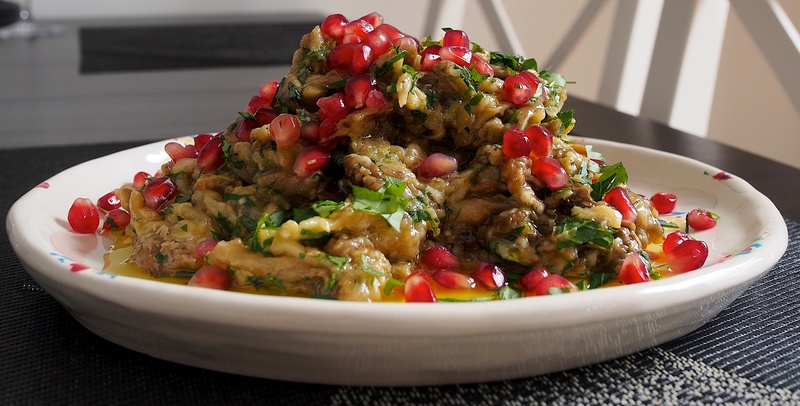 Wine Suggestion: We’ve been inspired to drink wines from the Eastern Mediterranean with this and have found that top Lebanese wines, like Chateau Massaya, with their bramble and plum fruits plus velvety spices work very well indeed. Brush the aubergine slices with olive oil on both sides then put on a baking tray in a single layer and roast until soft. You will either need to do this in batches or on two trays. They should take between 10 and 20 minutes but don’t let them get too brown. Meanwhile, heat 2 tbsp olive oil in a heavy-bottomed frying pan and sauté the onions until soft and golden. Add the garlic and continue to sauté for another few minutes, then add the mince and fry for 5-10 minutes or until well browned. Season and add the cinnamon, then add the chopped tomato, tomato purée and chopped parsley. Stir well, add the wine and simmer for 15 minutes or until most of the wine has been absorbed. While the meat is simmering make the béchamel. Put the onion, bay leaf and milk in a small pan and bring slowly to the boil. Take the pan off the heat and leave to infuse for 20-30 minutes with the lid on and reheat just before starting the sauce. Melt the butter over a gentle heat in a small pan. Just as the butter starts to foam, add the flour and stir gently for a few seconds. You want a thin bubbling base – if the butter hasn’t amalgamated with the flour, add a tiny bit more. Bubble for a couple of minutes or until it turns a pale biscuit colour. Add about half a cup of the hot milk and whisk hard until the mixture becomes thick. Add more milk and repeat – it will take longer to thicken each time. Cook the sauce more slowly and stir with a wooden spoon – add more milk until you get the right consistency. You want the sauce to be thick but not solid. Cook gently for 20 minutes, stirring often. Season and grate in a little nutmeg about half way through. 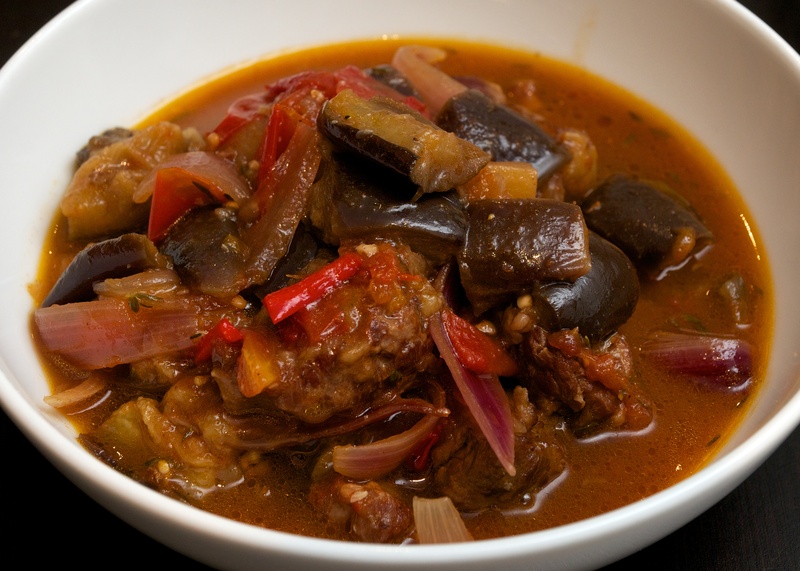 When the sauce is ready put alternate layers of aubergine and meat sauce in a deep baking dish or roasting tin, staring and ending with a layer of aubergines. 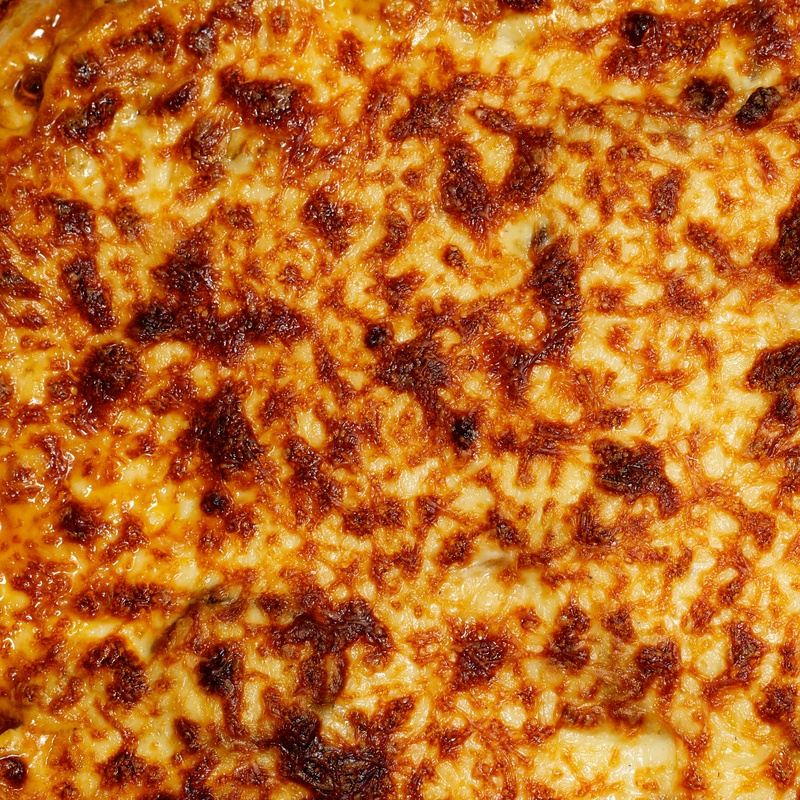 Pour a thick layer of béchamel over the top; you might not need it all. Sprinkle over some grated Parmesan if you like then bake in the oven for about 45 minutes or until brown on top.